In his book Inspired , Marty Cagan describes the job of the product manager as “to discover a product that is valuable, usable and feasible”. 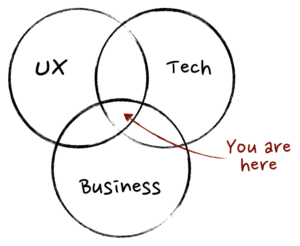 Similarly, I’ve always defined product management as the intersection between business, technology and user experience (hint – only a product manager would define themselves in a venn diagram). A good product manager must be experienced in at least one, passionate about all three, and conversant with practitioners in all. Business – Product Management is above all else a business function, focused on maximising business value from a product. Product Managers should be obsessed with optimizing a product to achieve the business goals while maximizing return on investment. Sorry, this does mean that you are a suit – but you don’t have to wear one.